This 6 CD presentation set contains the full story of Britain's best loved Offshore Radio Station. We trace the full story from 1964 right up to 1996. This 8 hour story features dozens of interviews with personalities, presenters, behind the scenes staff and Radio Caroline's founder - Ronan O'Rahilly. You'll hear off-air and studio quality recordings from the 1960s, 1970s, 1980s and into the 1990s, air-checks, jingles, promos and commercials. Included with each box set is a 24 page photo booklet containing photographs of the ships, studios and personalities, illustrations and information on Radio Caroline. 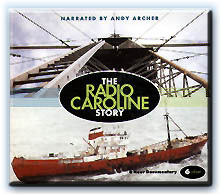 This 6 CD presentation set with 24 page photo booklet is the definitive sound production on the subject of Radio Caroline. 8 hour production on 6 CD's.